HAPPY CANADA DAY! I wish I could be BBQ-ing and relaxing today but unfortunately I have spent the entire long weekend packing/moving, making countless trips to furniture stores, and trying to come up with a suitable organization system for my new apartment. So stressful. So not fun. But hey... at least my nails are showing a little spirit! I've clearly been on a bit of a nail art streak lately (see my recent pastel rose & stripes manicure and nautical nails) so when the Fashion Magazine Beauty Panel was challenged to create some patriotic nail art, I had to participate. Check out the full post here. I love this design and you've done them so neatly too!! Happy Canada Day! Love the nails. Happy Canada Day! Hope you got the furniture you wanted! I got a few things I'm pleased with but waiting on delivery so looks like I'll be sitting on the floor for a bit! Happy Canada Day!!!! Love the mani. Its def perfect for this day. What a festive mani...it's perfect! 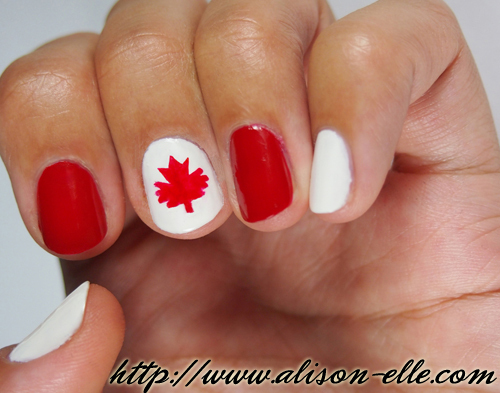 Using the think nail art brush was key for that... but also the reason I only did one maple leaf, haha! I love finding fellow Canadian bloggers! And I have definitely been on an obsessive nail-art streak as of late as well! Except mine involves nail wraps (what can I say?...I'm lazy lol). Now comes the unpacking... which I think may be even worse! that's adorable! happy belated canada day!